The rush of Egyptologists both aspiring and professional to Egypt at the beginning of the 19th century opened more than sarcophagi. Once the health benefits of a spell in Egypt reached European and American ears, the Pyramids witnessed an influx of invalids, and the establishment of a British protectorate over Egypt and the Sudan brought military corps and diplomatic officials to the area. After the opening of the Suez Canal in 1869, Society quickly followed in their wake, and it became smart to winter in Cairo. 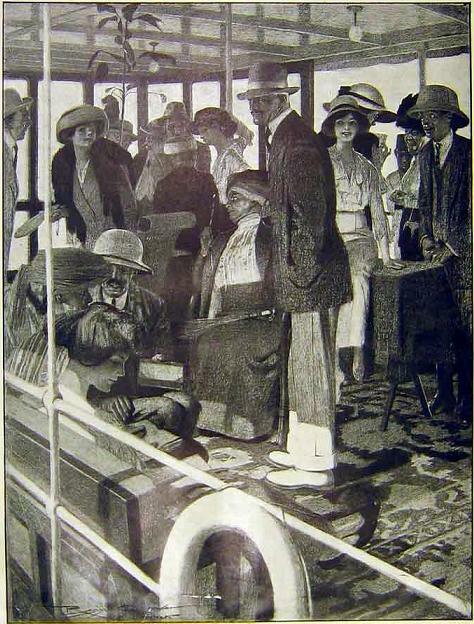 From November to April, many of the amusements and events seen in London or Paris were transplanted to Cairo,and the city, in the words of Burton Holmes, became “a sort of Oriental Paris or sub-tropic London — with here and there pronounced suggestions of Atlantic City, Newport, and Longacre [Times] Square.” The leading hotel was Shepheard’s, where it was said one could sit in the lounge and catch up with anyone! Other highlights of course included visiting the pyramids or sailing up the Nile, but also sporting events, gymkhanas, concerts, and balls, as well as visiting the court of the Khedive. Cairo was also very important to Parisian dressmakers, who used the winter season as a testing ground for the latest modes before moving the successes on to Monte Carlo, and those successes back to Paris. There’s a fairly good book about this–The Mistress of Nothing. Have you read it? I haven’t! I just looked it up, and I have read the memoirs of Lucy Duff Gordon. I’l have to add The Mistress of Nothing to my TBR list. This feels very timely, as I am currently reading my way through Elizabeth Peter’s Amelia Peabody series, which is set in exactly this context. It’s nice to have a visual to go with her narrative. They go pretty fast. 🙂 However, if you’re feeling unsure about them, then read the very first one and skip over the next four, then go back in. You’ll miss some of the plot points (though Children of the Storm has a synopsis to fill in the gaps, explain who the characters are, etc.) but those first ones aren’t her best.